I've been intrigued / obsessed with the story of my 2nd Great Aunt, Mary Bradley, since discovering this post back in 2002. Mary's story was a well-kept family secret. Here's what I have learned so far: Mary H. Bradley was born on April 24th, 18321 at Whitestown, Oneida Co., New York, the 6th child (4th living) of James D. and Tirzah (Lankton) Bradley. 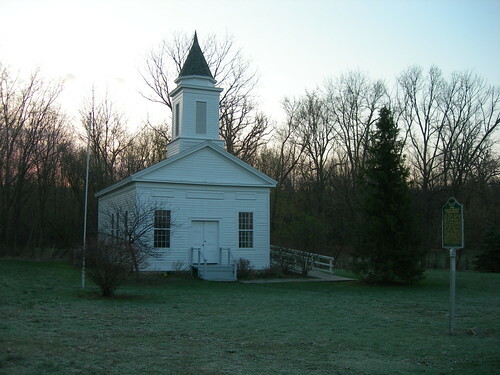 Sometime around 1841, when Mary was about 8 years old, the family emigrated to Kalamo, Eaton Co., MI. If Mary attended school, she didn't learn to write well, judging from her letters to her best friend, Watson Woodruff. As a young woman of 17 or 18, Mary intended to marry her "sweetheart," David Harrison Stewart, but gave in to her parents wish to marry Simeon Brooks, a much older wealthy land owner2. They were married on April 1st, 18513. Sometime later, after Simeon was buried, Ira Pearl, of Kalamo, made an official complaint, suspecting that he was murdered. Mr. Pearl was a farm hand who lived with various Eaton and Barry County families, and may have been living with Mary and Simeon at the time of his death. He seems to have implicated Mary and/or another, possibly Mary's friend, Watson Woodruff. "Watson the county is a going to take Sim up so pres swift told me last night he come from feroes and stoped and told me they aint agoing to do any more about it till he is examined and then they are agoing to take us both up "
Mary was so panicked that she thought the medicine must have been poison. "i am just as sure that was pison in that medicine as can be and if he is dug up and examined states prison is my doom"
When Mary told her family about the medicine, they also believed that there wasn't much they could do for her. "watson for the land sake if you have got any mercy on me or want to relieve my trouble do dig him up night off to night i told father jo and tru abaout that medicine and they said it would ruen me and send me to states prison in spite of all they could do if he was dug up and examined"
It's not clear whether or not Simeon's body was actually exhumed. In the short history I found, there was no mention of test results proving guilt. Judge Abner Pratt appointed John Van Arman as the prosecuting attorney for this case. Van Arman was a popular and well known defense attorney, the most successful of his time. He became famous for the acquittal of a Hillsdale, Michigan woman where he, himself, ingested arsenic in the courtroom and lived, proving that she could not have murdered her husband with arsenic8. He convened a secret Grand Jury and the testimony led to the indictment of Mary Brooks, accusing her of the murder of her husband by arsenic poisoning, which was allegedly stolen from a neighbor, Mr. Mann. Although the court was nearing the end of a session, where most cases would be continued to the next session, Judge Abner Pratt ordered the trial immediately. 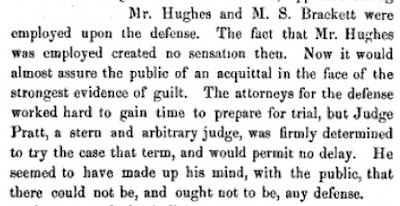 Mary's family hired Mr. Dave Hughs and Mr. Martin S. Bracket to defend her, and they worked hard to get more time to prepare a defense, but Judge Pratt would not permit a delay. He seemed to believe that Mary was guilty and didn't deserve a defense. The court room was packed on the 5th and 6th of June, 1856. The windows were removed and wagons set up underneath them for those who couldn't get in. "During the solemn hush caused by the rendering of such a verdict the judge told the defendant to arise, and then asked her if she had anything to say why the judgment of the law should not be pronounced against her. She very naturally supposed this called upon her for a speech. Evidently feeling that she herself must make her only defense, she at once arose and stepped upon the raised platform by the side of the judge's desk to address the audience. As if her proximity to the judicial ermine was contamination, Judge Pratt sternly and harshly ordered her to go down upon the floor, moving his hand as if to push her away. The scene is yet vivid in my mind. Judge Pratt, with his black bushy hair standing fiercely erect, his black piercing eyes shooting fire from under his shaggy, overhanging eyebrows, appeared the personification of sternness and the power of the law. There was the woman, with her calico sun-bonnet shading her face, shrinking pitifully away, crushed and confused by this unexpected rebuff when called up to speak. She again rallied, but in her confusion she addressed "this congregation," as if it was a church trial. She spoke with much feeling of her recent loss of a young babe, claiming that she had not since been in her right mind in consequence of her great trouble. She did not expressly deny the crime, but conveyed the impression that she did not feel responsible for anything she might have since done. Here was a rich lead for able attorneys, could there have only been time to work it. She spoke but a few moments,—did not ask that court for mercy, and appeared overcome by emotion as she sank into her seat. The judge then again called upon her to stand up, and delivered to her a harsh, angry rebuke for the terrible crime of which she had been found guilty. He appeared to abandon himself to an impetuous determination to be as severe and crushing as possible. He was so vindictive and ferocious that his remarks failed to produce the effect designed. It afforded her a tempest to brace up against. He closed by pronouncing a sentence to hard labor in the State prison at Jackson during life, forgetting, in his virtuous indignation, to include solitary confinement." After the trial, Judge Pratt spoke of his sentencing address, saying that he forced himself to stop, fearing that he was making a fool of himself. The prosecuting attorney, Mr. VanArman, remarked that there wasn't even enough evidence to convict her of larceny for stealing arsenic, let alone murder. "The injustice in this case was on the part of the court,in forcing the defendant so suddenly to trial without giving her attorneys an opportunity to prepare for such a defense as should have been made in the case. The testimony which led to her indictment had all been taken secretly by Mr Van Arman before the grand jury, while under present improved practice every word of it would been taken publicly before an examining magistrate, reduced to writing, signed by the witnesses, filed in the clerk's office as a public record, and thoroughly understood and sifted by the attorneys on both sides. The more humane tendency now is to give the defendant a full opportunity to confront and hear his accusers, and to have every facility for making his defense." Part 2 - "He Wooed Her in Prison"
2. HISTORY OF INGHAM AND EATON COUNTIES MICHIGAN By SAMUEL W. DURANT, pg 362,"Her husband was much older than herself..."
Excellent article Pam, can't wait for Part 2. Great story! I was on Google looking for for a plot map to Riverside Cemetery and came acorss your publication. Not guilty! Thanks for reading Christine! I agree, Not Guilty! I had no idea about this, really cool story. I came across a short article about Mary Brooks in an 1899 Oregon newspaper while doing research for a book of newspaper clippings and was delighted to find the rest of the story in your blog. And what a story it was! I would like to include a link to your blog in my book, if that is okay with you. I have one Kindle book already published called THE COFFIN WAR and a second book, CHICAGO CLIPPINGS, will be out in a couple of weeks. The clipping about your great aunt will be in OREGON CLIPPINGS in several months.